Be the first to share your favorite memory, photo or story of Jacob "Jake". This memorial page is dedicated for family, friends and future generations to celebrate the life of their loved one. 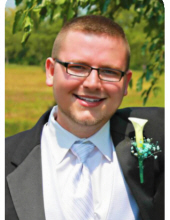 Jacob N. “Jake” Stoner, 28, of Madison Township, passed away after a courageous battle with cancer on Wednesday, November 7, 2018, at University of Cincinnati Medical Center. He was born in Middletown on August 10, 1990. Jake graduated from Edgewood High School in 2008. He attended Miami University and Sinclair and he was only one semester away from obtaining his degree in cyber security. Jake had grown up in the family business, Stoner Holsters, from an early age, holding virtually every position in the company. Jake is survived by his devoted wife, Andrea Stoner and beloved dogs, Copper & Shadow; father, Douglas Stoner; mother, Chastity Fletcher; brother, Nicholas Stoner; sister, Caycee Stoner; paternal grandparents Jeff & Jeanne Stoner; maternal grandmother, Judith McIntosh; maternal grandfather, Scott (Brenda) Fletcher; and many loving aunts, uncles & cousins. Funeral Service will be held Friday, November 16, 2018 at 1:00 pm at Wilson-Schramm-Spaulding Funeral Home, 3805 Roosevelt Blvd., Middletown with Pastor Stephen Withrow officiating. Visitation will be Thursday from 4:00 - 7:00 pm at the funeral home. Interment will be at Butler County Memorial Park. Memorial donations may be made to American Cancer Society, 2808 Reading Rd., Cincinnati, Ohio 45206. To send flowers or a remembrance gift to the family of Jacob "Jake" Stoner, please visit our Tribute Store. "Email Address" would like to share the life celebration of Jacob "Jake" Stoner. Click on the "link" to go to share a favorite memory or leave a condolence message for the family.